The world famous Dhanu Yatra here ended on Sunday night with an open stage Pandal playing death of king kansa at the hands of lords Krishna and Balaram. The mighty king finally collapsed on the resplendent Pandal of his Ranga Shabha marking the end of the Mathura Nagari(Bargarh) for the Dhanu Yatra. Kansa was sure that he would kill the duo as he was unaware of their divine power and relied more on his muscle power. He fought with them and killed. 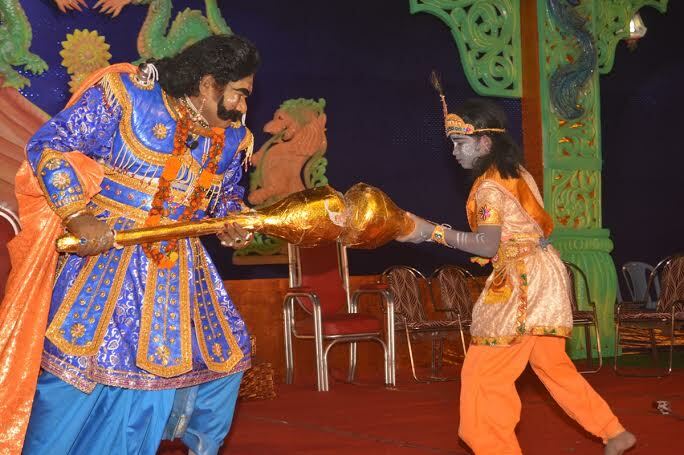 Lord Krishna’s in carnation was meant to destroy all the evil forces with the 11-day long Dhanu Yatra, the biggest open air theater of the world Kansa after hearing a voice from the heaven about his death and the killer had taken all precautions to save his life from child Krishna. He killed all the eight Children of his sister Devaki, But his death was pre-ordained. On the invitation of Kansa two brothers Krishna and Balaram had come to killing of Kansa. Citizens of Mathura heaved a sing of relief after the demon king’s death king Ugresan reoccupied the throne.With Kansa having been killed, the common citizen began to celebrate the moment and say that ‘Kansa Raja Bansa budu Aame Khaibu Hurum Ladu’’ Although the Dhanu Yatra shows the same event every year, yet we feel it to be totally a new. During the yatra period some state and central Ministers and secretaries of various departments paid their visit.